Bamburgh is a beautiful coastal town in the heart of Northumberland. 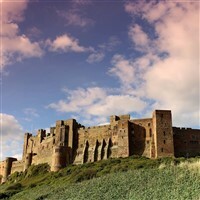 Thousands of people visit Bamburgh every year for its famous castle, coastlines & walking trails. Seahouses fishing past lives on at Swallow Fish, who operate the UKs oldest operating smokehouses. Visitors are welcome at The Fishermans Kitchen where historic fishing memorabilia and curios are displayed alongside the local catch of the day. Skim over the sands and causeway to Holy Island and prepare to enter another world. Lying just a few miles off the Northumberland coast, Holy Island is cut off twice-daily from the rest of the world by fast-moving tides. Both an island and a picturesque village, Holy Island carries a wealth of history within its tidal walls. Experience the serenity of 12th century Lindisfarne Priory, the epicentre of Christianity in Anglo Saxon times and once the home of St Oswald. This peaceful setting was the birthplace of the Lindisfarne Gospels, one of the worlds most precious books. Ransacked by marauding Viking raiders in the 8th century, the evocative ruins of Lindisfarne Priory include the famous rainbow bridge which spirals skywards with the ghost of a long-vanished tower.